Whether you are just starting out and want to get your toes wet or are have been neck deep for years, NEA has something for you! Attendees come during all stages of their careers - from students and new professionals to veterans and those mid-career - who hail from a wide range of repositories and records management programs and allied professional such as state/town clerks and museum professionals. Attend a workshop or meeting; join us and become part of our mission to bring the past into the future! How do I register to attend a meeting or workshop? To register for workshops and meetings, click on the event listing on our homepage or the “Register” link on the meeting information page. Follow the prompts to register online using PayPal or see below to register online and pay by check. I have questions about disability access or accommodations for the meeting - who do I contact? If you have questions or concerns about accessibility and/or disability accommodations at an event or during the registration process, please contact NEA’s Inclusion and Diversity Committee at diversity@newenglandarchivists.org for assistance. I have a food allergy/dietary restriction - who should I contact? NEA works to make sure your experience will be a pleasant and accessible one, in keeping with our commitment to inclusion and diversity. As such we will do our best to accommodate your dietary needs. Please contact NEA’s Inclusion and Diversity Committee at diversity@newenglandarchivists.org for assistance. What does it cost to attend an NEA meeting or workshop? 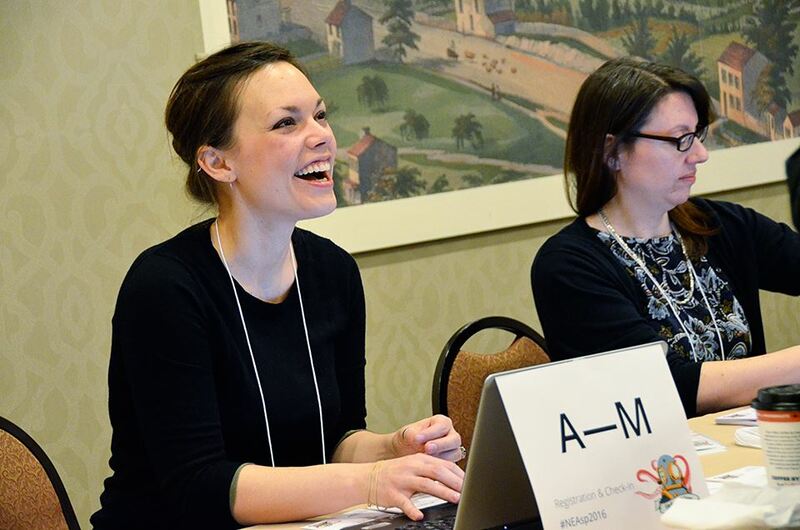 Registration rates vary slightly with every meeting or workshop: please refer to the individual event page for costs or email the NEA Registrar, Olivia Mandica-Hart, at registrar@newenglandarchivists.org. Rates are set according to the Registration Policy approved by the NEA Executive Board on July 8, 2016. Certainly! However, we strongly recommend that you register before the event as our early-bird and advanced registration fees are lower than our on-site registration rates. I am a member - do I have to do anything special to register? In order to receive the member rates, make sure to first log-in to your member account on the NEA website. Once logged-in you may click on “View Profile” in the top right of the screen to check your membership status, verify your membership is current and view your renewal date. Don't have a Member Profile password or can’t remember what it is? Contact the NEA Membership Secretary, Elizabeth Slomba, at membership@newenglandarchivists.org for assistance in assessing your member account. I am not a member - can I attend the meeting/workshop? Non-members are welcome to register for all NEA meetings and workshops. If you are not a member and are planning to register for a meeting or workshop, please consider joining NEA. Membership provides significant cost savings on events throughout the year. Learn more and consider joining us. I am a student, can I attend at a reduced rate? Yes, student members of NEA are eligible to register at the student rate that starts at 50% of the individual member rate. Please refer to the individual event page for costs or email the NEA Registrar, Olivia Mandica-Hart, at registrar@newenglandarchivists.org. If you are not a student member and are planning to register for a meeting or workshop, please consider joining NEA. Membership provides significant cost savings on events throughout the year. Learn more and consider joining us. I am experiencing financial hardship - can you help? NEA offers a special registration "bridge" rate for members who self-identify as un- or under-employed. This rate option will be available for members, who are logged in to their member profile, to select when registering. The bridge-rate was an initiative of the Membership Committee on behalf of the membership, and was voted on by the Executive Board on January 13, 2012. Does NEA offer any scholarships or financial aid? Yes, we offer a number of scholarship opportunities as a benefit to our members to help defray the cost of professional development. For Spring meeting sessions that focus on issues of inclusion and diversity, we offer the IDC Scholarship. NEA also offers a special bridge-rate registration for members who self-identify as un- or under-employed. I received a scholarship - how do I register? Any NEA member who is awarded a meeting and travel assistance scholarship will be notified by the Award Committee. Each awardee will receive a check prior to the meeting from the NEA Treasurer, for the amount awarded. Awardees are responsible for registering to attend at the early-bird rate. Recipients of the IDC scholarship register at the early-bird rate and then submit receipts for reimbursement along with their other expenses. Please contact the NEA Registrar, Olivia Mandica-Hart, at registrar@newenglandarchivists.org if you need assistance. NEA will issue a refund minus a $25 cancellation fee individual or institutional members and $10 for student members for registrations canceled up to 10 days prior to the spring meeting. For workshops and fall meetings, NEA will issue a refund minus a $10 cancellation fee for up to 10 days prior to the workshop or meeting. Exceptions to the cancellation policy will be made at the discretion of the Registrar. Past exceptions have included waiving the fee for individuals who have experienced a death in the family, a serious unforeseen illness of the attendee or a dependent, and loss of employment. Please contact the NEA Registrar, Olivia Mandica-Hart, at registrar@newenglandarchivists.org if you feel there are extenuating circumstances to your cancellation. Can I send a colleague if I can’t make it? If you are unable to attend a meeting or workshop for which you registered but a colleague can attend instead, you may request a substitution from the NEA Registrar, Olivia Mandica-Hart, and send them in your stead. Please see our Registration and Cancellation Policy for more details. I had to cancel my registration, how will I get my refund? All refunds are made via check made out and mailed to the name and address on file in the membership database. If you need the check made out to your institution or mailed to a different address please contact the NEA Treasurer, Cyndi Harbeson, at treasurer@newenglandarchivists.org for assistance. I had to cancel my registration, when should I expect a refund? Refunds are typically processed after the event. If you’ve been waiting and still haven’t received a refund please contact the NEA Treasurer, Cyndi Harbeson, at treasurer@newenglandarchivists.org for assistance. I am not a US resident - can I still register to attend an NEA meeting or workshop? NEA is pleased to welcome individuals from all countries to our meetings; recent international attendees have hailed from Canada, Australia, Norway, the Netherlands, Germany, Israel and Switzerland. Sometimes different technology and currency standards can cause difficulties when registering so please do not hesitate to contact the NEA Registrar, Olivia Mandica-Hart, at registrar@newenglandarchivists.org for assistance. Yes. You will receive an email confirmation after completing your registration and payment in full. If completing payment online, PayPal will also send an email confirmation recording the transaction. I registered online, but my information has changed - how do I update my registration? All my colleagues know me by a nickname but I prefer keep my official name on my membership profile so my copy of the NEA Newsletter doesn't get lost in the mail - can you print my preferred name on my name tag? We definitely want your colleagues to know who you are so we are happy to print your preferred form of name on your meeting name tag. Please email the NEA Registrar, Olivia Mandica-Hart, at registrar@newenglandarchivists.org with your preferred designation if it differs from your information in your membership account. How do I complete registration and payment for my department’s staff? If your staff are individual NEA members, please have them log in to their member profile and begin the registration process. At the confirmation screen select “Invoice Me.” This will generate a copy of the invoice with a link to pay online that will be sent to the email listed in the member profile. This can then be forwarded to the appropriate individual for payment. I think my institution is a member - how do I find out? All institutional members have a designated primary contact responsible for maintaining their membership account. If you do not know who your primary contact is please contact the NEA Membership Secretary, Elizabeth Slomba, at membership@newenglandarchivists.org. My employer is an institutional member - how can I register using their membership? All institutional members may send one staff member to each event at the member rate. The primary contact listed on the account is responsible for authorizing attendance. If you do not know who your primary contact is please contact the NEA Membership Secretary, Elizabeth Slomba, at membership@newenglandarchivists.org. I am presenting at the meeting - do I need to register? Yes. All session presenters are required to register online, pay, and check-in once onsite. NEA is pleased to extend the early-bird member rate to all presenters, regardless of membership status. Additionally, workshop instructors at spring meetings may register at the presenter rate if attending the meeting. A special Presenter category will be available on the website for both one- and two-day registration options at the member rates. Presenters are also eligible to take advantage of the discounted "bridge" rate if they self identify as un- or under-employed. Please make sure to complete your registration prior to the expiration of the early-bird rate. I am not a member but I’m presenting at the meeting - how do I register? A special Presenter category will be publicly available on the website for both one- and two-day registration options at the member rates. Non-member Students and non-members who self identify as un- or underemployed may contact the NEA Registrar, Olivia Mandica-Hart, at registrar@newenglandarchivists.org to receive the corresponding member rates. Can I exhibit at your meeting? Yes. NEA offers vendors and individuals representing companies, products, and services dedicated space during our annual spring meeting. Our diverse membership provides an excellent opportunity to promote new ideas, products, and opportunities. For more information on exhibiting at our meetings, please contact the NEA Vendor Coordinator, Jane Ward. I am unable to staff a table at your meeting, but would love to promote my products/services - what other vendor options do you offer? NEA offers vendors and individuals representing companies, products, and services a variety of promotional opportunities including advertising the in the NEA Newsletter, space in the meeting program, and meeting sponsorships. For more information, please contact the NEA Vendor Coordinator, Jane Ward. I am a vendor - how do I sign up for a table at the meeting? Vendors do not need to sign-up or register to attend NEA events in the same manner as attendees. All arrangements with vendors are handled exclusively by the NEA Vendor Coordinator, Jane Ward, including payment for attending or otherwise promoting products and services to attendees. Does NEA permit vendors to present at meetings? In an effort to eliminate any conflict of interest while providing optimal educational opportunities, vendors may present at a conference or meeting only as an invited guest on a panel, discussion group, or other programmatic component. In the case where a vendor is also a member of NEA, that individual may not abuse the privileges of being a member. Vendors are prohibited from using the membership database, which they have access to as a member, to advertise their company, product, or services. Please see our vendor policy for more detailed information. Does NEA have a code of conduct for its events? Yes, it can be found at NEA Code of Conduct. Please contact the NEA Inclusion and Diversity Committee at diversity@newenglandarchivists.org with any questions. I’ve already registered - why do I need to check in? We ask that all attendees check in at the registration desk so we can give you a name badge and program and answer any questions you might have. Checking in also allows us to positively confirm your attendance, which provides data allowing us to build better meetings in the future. I’m here! When does the registration desk open so I can check in? Registration typically opens an hour prior to the start of the first session. For specific times, please see the online schedule on the meeting page. Where do I collect my name tag? You will be able to collect your name tag when you check in at the registration desk. The open hours and location of the registration desk varies by meeting so please check the meeting page on our website for detailed information. Can I get a copy of the meeting attendee list? Yes, please ask for a copy at the registration desk. We only print a small number of copies in order to reduce paper waste. I need a letter of attendance for my employer - can you provide one? What support does NEA provide for nursing mothers at workshops and meetings? For the past few years we have been pleased to offer a lactation room at our meetings for mothers who prefer to breastfeed or pump in private. Please contact the NEA Inclusion and Diversity Committee at diversity@newenglandarchivists.org for more information on accommodations. Will NEA continue to provide gender neutral bathrooms at meetings? Yes, NEA supports inclusion and diversity as core values in achieving its mission, and we are committed to building and maintaining an inclusive environment where differences of opinion, beliefs, and values are sought, listened to, respected, and valued; including gender expression. We practice this value by creating welcoming and inclusive spaces at our meetings. Bathroom facilities that are physically accessible (ADA compliant) and open to people of any gender are just one of the ways in which we show full welcome and inclusion to our constituents. Please contact the NEA Inclusion and Diversity Committee at diversity@newenglandarchivists.org if you have any questions. I have an allergy or specific dietary restriction - who should I contact? NEA works to make sure your experience will be a pleasant and accessible one, in keeping with our commitment to inclusion and diversity. As such we will do our best to accommodate your dietary needs. Please contact the NEA Inclusion and Diversity Committee at diversity@newenglandarchivists.org for assistance. I can’t make it to the meeting/workshop. Will slides and handouts be released? Materials from the fall and spring meetings are generally made available, with the permission of the presenter, on the meeting webpage following the event. Materials from workshops are generally only made available to attendees. Please contact the NEA Education Coordinator, Stephanie Call, at education@newenglandarchivists.org with any questions. Can I follow the meeting via Twitter? Absolutely. The NEA Twitter handle is @NEarchivists. Meeting and session hashtags are posted on the meeting webpage and in the printed program. I registered as a non-member but the meeting was so great I want to join - can I get a membership onsite? That’s great to hear! The registrar can enroll new members or renew a lapsed membership at the registration desk during open hours at the fall and spring meetings. If you missed the NEA Registrar you can always join online. Since the meeting is taking place in such an awesome city I decided to bring a friend/family/partner - can they attend the evening reception at the spring meeting? We encourage attendees to take a break from the meetings to enjoy the wonderful cities that host our events. Guests are likewise welcome to attend the evening reception. However, we do ask that attendees purchase a guest ticket in order to keep costs down for our membership. Tickets are available online when registering or may be purchased onsite from the NEA Registrar. I don’t remember signing up for anything - how did all the vendors get my email? Attendees may specify on their meeting registration forms that they do not want their contact information shared with vendors. Please contact the NEA Registrar, Olivia Mandica-Hart, at registrar@newenglandarchivists.org with any questions concerning opting out of sharing directory information at meetings.